Christian groups and religious families have been publicly shunning the new Star Wars movie, and it doesn’t even hit theatres for over a year. Many devout, religious people are complaining that a single, quick image from the trailer is proof that the movie’s director, J.J. Abrams, as well franchise owners Disney, are out to promote the worship of Satan. 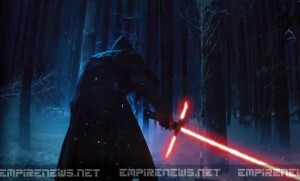 In the film’s trailer, a Sith is seen carrying a lightsaber, the popular weapon of choice for the Jedi characters as well as their rivals, with “spokes” that come out of either side of the handle. Star Wars: Episode VII – The Force Awakens is scheduled for release in December, 2015.